DeRay Mckesson speaking in the Katzen Arts Center. 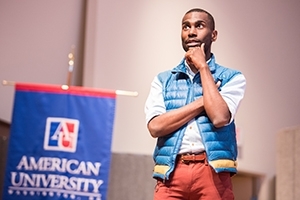 DeRay Mckesson is a leading voice in the Black Lives Matter movement. With BLM now at the forefront of civil rights activism nationally, Mckesson has a strong platform to speak out on a variety of social justice matters. Like the movement itself, he effectively utilizes social media, and he has more than 700,000 Twitter followers. Yet in his fight for racial equality, he’s also been on the protest front lines of Baton Rouge, Louisiana and Ferguson, Missouri. He’s been especially active in his home city of Baltimore, working for the city school system and running in the 2016 Democratic mayoral primary. Though BLM is known for its opposition to police brutality, the collective has outlined a much broader manifesto. The policy proposals include robust public investments in education, which Mckesson discussed on February 16 in the Katzen Arts Center at American University. AU’s School of Education hosted the event, with SOE Dean Cheryl Holcomb-McCoy giving introductory remarks. At the outset, Mckesson discussed the battleground of ideas, and he noted that ideas travel in stories. He felt like this was an area in which Black Lives Matter excelled. “We told a story about America, and a story about progress, and a story about the police, that was really different,” he said. He mentioned how in 2014, while living in Minneapolis, he was inspired by the protests over the Michael Brown shooting and traveled to Missouri. He’d sleep on people’s couches just to remain in the state and stay active. “We saw so many people come together in St. Louis, and all across the country, sort of pushing back not only with our bodies, but pushing back with our words. Forcing people to confront something that they weren’t willing to confront before,” he told the AU crowd. He argued that progressive activists need to be ambitious and creative during Donald Trump’s presidency. “It can’t be four years of straight up just opposition. We have to also fight for real things, too, in this moment. I worry sometimes because I’ve seen people get so defeated that they forget to dream about what the world can be,” he said. School of Education Dean Cheryl Holcomb-McCoy introduced Mckesson. Mckesson taught in New York City and he’s been a human resources administrator for public schools in Baltimore and Minneapolis. Unfortunately, he said, the recent confirmation process of Education Secretary Betsy DeVos “flattened” the conversation over school choice, vouchers, and charter schools. “These are three fundamentally different things,” he noted. Defending school choice, he said that there might be a school—such as an arts or science institution—in another district that would be a better fit for a child. Vouchers present challenges, he said, because students may use them to attend private schools, which often have no way of measuring educational outcomes. He added that voucher money can be so paltry, it limits the school options for poor minorities. He compared experimentation in schools to open discussions on social media. “Classrooms and Twitter are like the last few radical spaces in America,” he said. “I’m a huge fan of Twitter. I think that so many conversations have happened in the national space, and so many people are thinking about things that they didn’t think about before,” Mckesson argued. Mckesson took a number of questions from the AU audience. A freshman student mentioned how a Black Lives Matter group she co-founded in high school was categorically dismissed by critics. Another student asked if he’d consider running for public office again. One question touched on how to convert smaller protests into a larger movement. “There’s no magic sauce, in that you should do what you think works and see what sticks. We launched a lot of things that...you’ve never heard of because they didn’t stick,” he explained, while other initiatives were more successful.